I like to cut and paste: Tag Time! Here is my tag in it's little pocket. 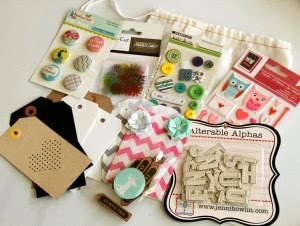 Lot's of Tim Holtz stuff going on here ;) But scroll down so you can see the rest of the tag! Super cool, right? (toot too!) I do love how this turned out. 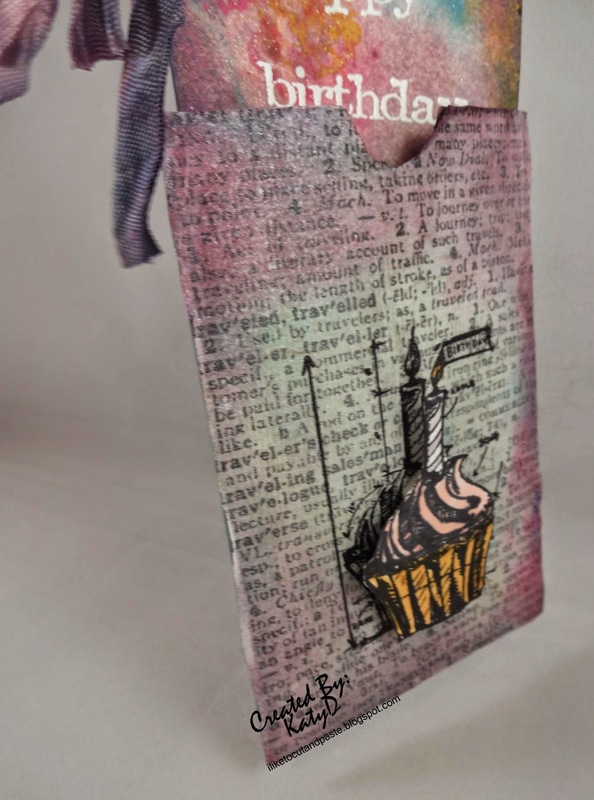 I used Tim Holtz Distress Paints for the background and dusty concorde distress ink around the edges. Everything is Tim's except the Recollections washi tape and that cool note. The note is from Unique Laser Designs. I gessoed it and then used seedless reserves and pewter Tim DP to paint it. The happy birthday is white embossing powder. The ribbon is crinkle ribbon using mostly dusty concord distress stain. I made the pocket on my Cricut using the Going Places cartridge. 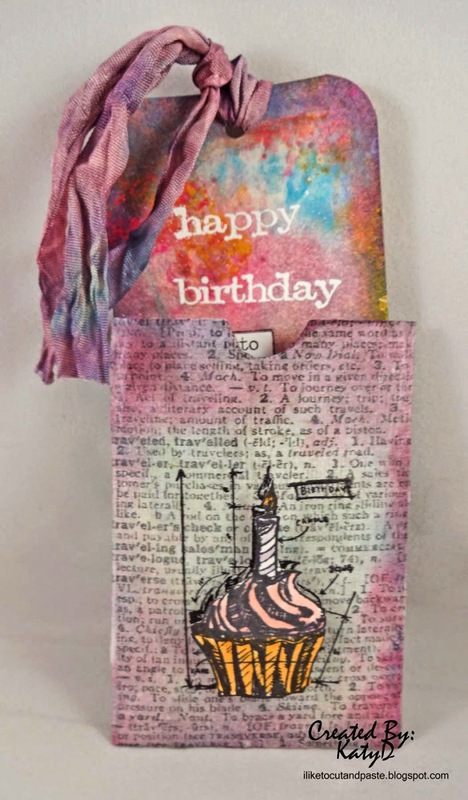 I glued Tim Holtz's tissue paper to the front using modge podge. Then with distress inks (scattered straw, picked raspberries, and salty ocean) I inked the front. The stamps is Tim's too. I stamped it on the tissue paper before the ink. Then I restamped it on white cardstock and cut out the cupcake. I colored the cupcake with Copics and pop dotted it. Here is the prize for this months's Tags and Bags Challenge. Thanks Amanda for these awesome goodies! I hope you will come and join us! Absolutely gorgeous! LOVE the colors and that cupcake!!!!! This is such a fun birthday tag. Love the envelope for the tag. 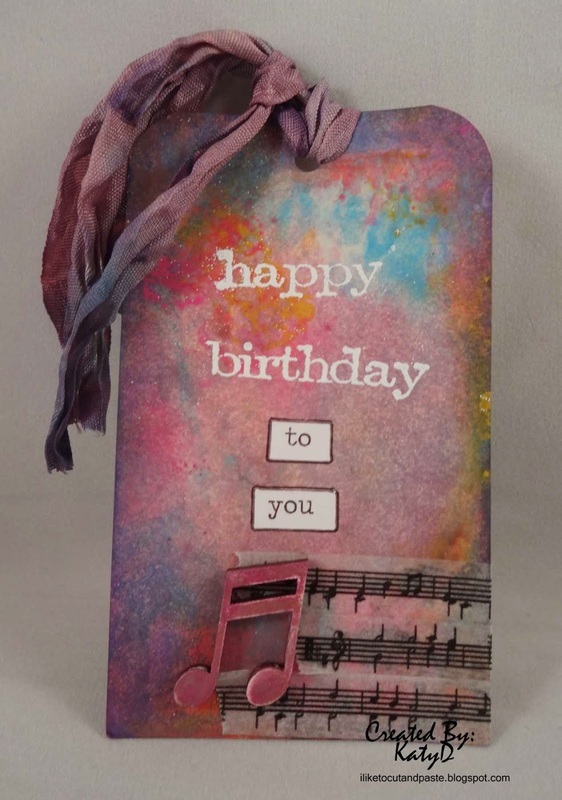 Thanks for joining in with at Ladybug Crafts Ink for our Birthday challenge.